What Are Progressive Web Apps? Are PWAs the Apps of the Future? Some are calling progressive web apps, or PWAs, the apps of the future. But what are these apps, how are they unique and why should you care? Well, it has been theorized that progressive web apps will gradually overtake the traditional mobile app. Others believe progressive web apps could simply be just one more engagement tool available to companies; a tool that sits alongside traditional apps and websites, rather than replacing them. Whatever your opinion is on the future of PWAs, one thing is clear: these “apps” are worth considering as you develop your company’s digital presence. Image Source: Pixabay user niekverlaan. Progressive web apps are essentially a blend of the traditional browser experience and the mobile app experience. PWAs are web-based applications that are intended to cater to users on a laptop or a mobile device such as a smartphone, tablet or phablet. So if you were on a laptop, the app would behave more like a traditional website, whereas mobile users would enjoy an app-like experience. There’s no need to install an application, yet a PWA is consistently available via an icon on your mobile device screen. However, you have to have a working internet connection to access the PWA, since only a fraction of its data will be stored locally. PWAs pre-cache some of the key resources and elements that are required to run the app, so parts of it may remain functional even if the device hits a dead-zone in terms of cellular coverage. The pre-caching function reduces reliance on a network to a limited extent. It also allows for faster load times and less data usage than a traditional mobile-optimized website (which is great news for users who have a data usage limit on their mobile service plan). Progressive web apps can interact with mobile device hardware and many include features such as push notifications—functionalities that are commonly associated with traditional mobile apps. According to Google’s developer portal, the richer, more responsive user experience “helped AliExpress improve conversions for new users across all browsers by 104% and on iOS by 82%.” Notably, Google’s open-source tool, Lighthouse, allows PWA developers (and traditional website developers) to optimize their apps while minimizing testing requirements. The PWA was actually Google’s brainchild. Google began promoting the concept of the PWA to developers in 2015, pitching this technology as a richer, less restrictive, more accessible alternative to the traditional native mobile app. Who Would Benefit From a PWA Most? The app would require data or WiFi to function anyway. ♦ Example: A mobile app that needs to send information to a server in real-time, all the time, such as a reporting and note-keeping tool for doctors. ♦ In this case, the user would almost always be using a hospital’s wifi network, so storing all the components of the app natively may not be necessary. The app will be accessed on a tablet device. ♦ Generally speaking, tablet users leverage WiFi to perform tasks on their device, much like those using laptops or PCs. This makes a PWA more feasible than a phone, which may be used in the office, home, gym and mall all in one day. ♦ When it comes to response times, users expect websites to load in 2-3 seconds. On mobile phones, users expect load times to be under 500 milliseconds. Assuming that tablet users lie between these two expectations, the speed of a PWA may be perfectly acceptable, since PWAs have some elements pre-loaded and others at their beck and call via an internet connection. ♦ Tablets have more screen real estate. PWAs offer more flexibility and few bugs when scaling to screen sizes that large, which can be a plus in terms of usability and maintenance cost. In summary, PWAs are still an emerging technology with a lot of potential. They can be a great, cost-saving option in certain cases, and a headache in others. Many companies may take a wait-and-see approach as they determine whether a progressive web app is right for their needs. Whether you choose a traditional mobile app or a PWA, you’ll want to trust your development project to a world-class development team. 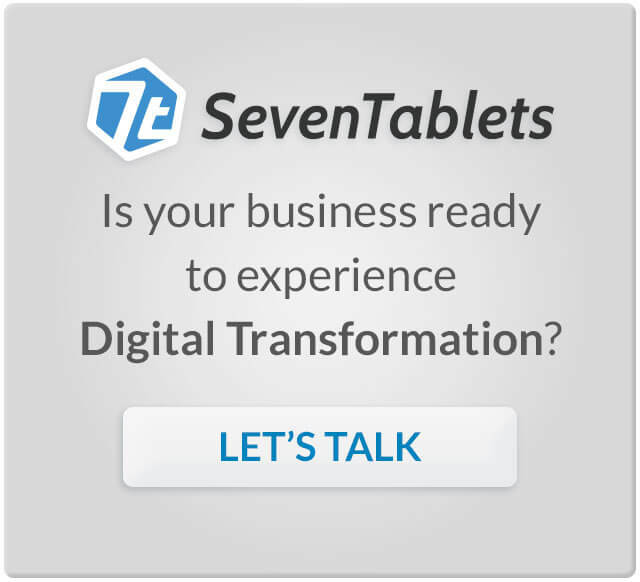 At SevenTablets, we specialize in other emerging technologies such as machine learning, blockchain, predictive analytics, augmented reality, virtual reality, artificial intelligence and natural language processing. Based in Dallas, SevenTablets also serves Austin and Houston, although we work with clients nationwide. If you’re ready to discuss your project, contact our team today. PWAs vs Mobile Apps: Which is Best for Your Needs?